Gorgeous as always! You do the best manicures :) I also wish I had more accessibility to Zoya in Canada... idk why but I can never find the most current collections! It's definitely intimidating, but the results are worth it! Did you paint your nails with any kind of "base coat/color"first to help make the colors pop more? By the way they are gorgeous! Oh gosh, I completely spaced on mentioning that! I did paint my nails with a white base first. Did you paint your nails with any kind of "base coat/color"first to help make the colors pop more? this is really amazing! perfect job, its gorgeous! Live it! How do you get the water at the right temp. It never works for me!!!???? It's mostly been experimentation, unfortunately! I am always sure to use filtered water (I filter it through a Brita first), and then I microwave it for a bit if it's too cold. I usually try to tell if it's at the right point by putting my finger in the water halfway. When I can't tell the difference between the half that's in the water and the half that's out of the water, I know it's good to go. 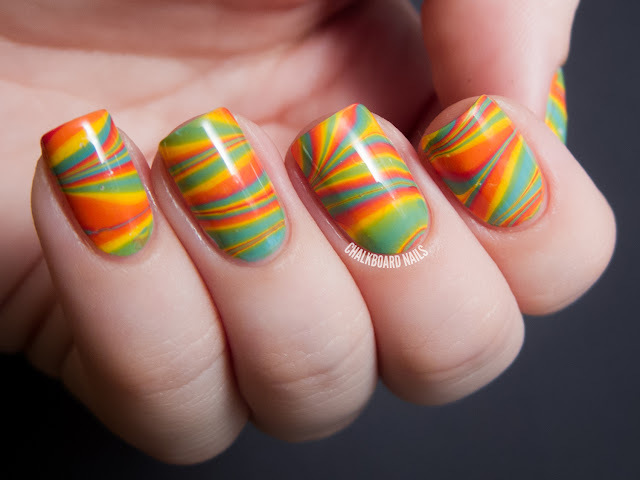 Gorgeous water marble, the colors work well together! I said some unrepeatable words when I saw this, it's absolutely amazing!! Hmm, that must be frustrating! 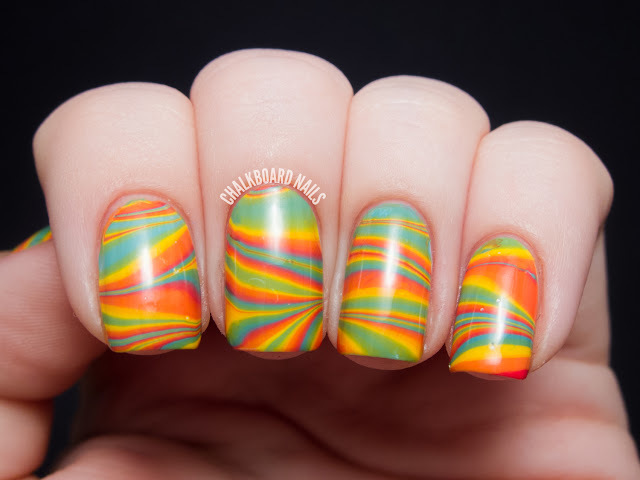 Maybe Rebecca from Rebecca Likes Nails has some suggestions as to where you can find them? What a perfect marble! So fun and colorful :). Wow - this is gorgeous; so bright and summery! I love it! 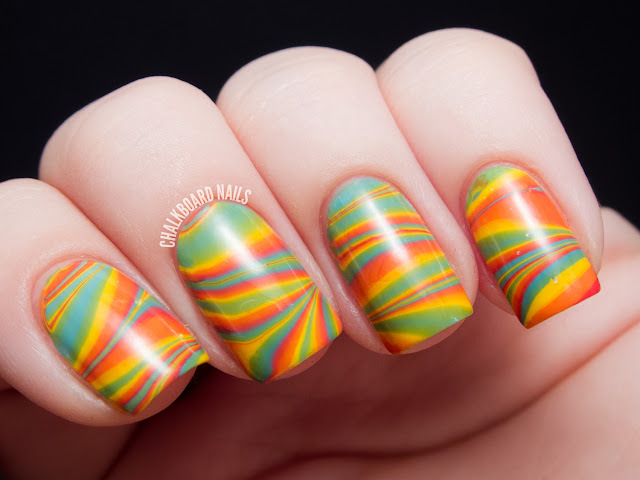 The colours are definitely bright and summery, I can't believe how amazing you are at watermarbling though! Mmm, it looks like Fruit Striped Gum! Delicious! This is amazing! Easily my favourite water marble I've seen. 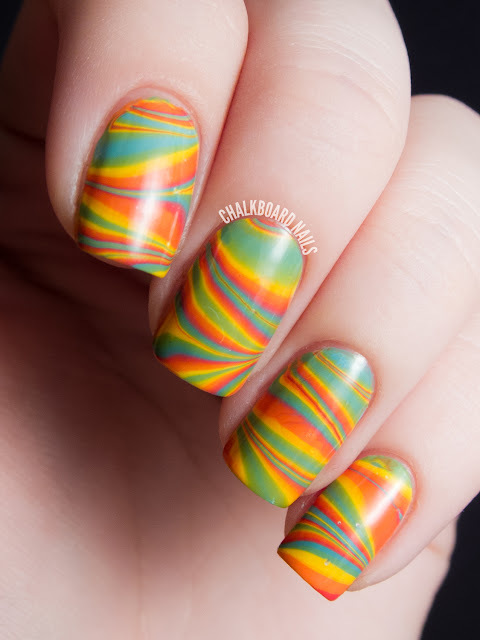 I've tried water marbling once, and it was, well, crap. I'll have to give it another go! My mouth literally did water looking at this mani. I love citrus! 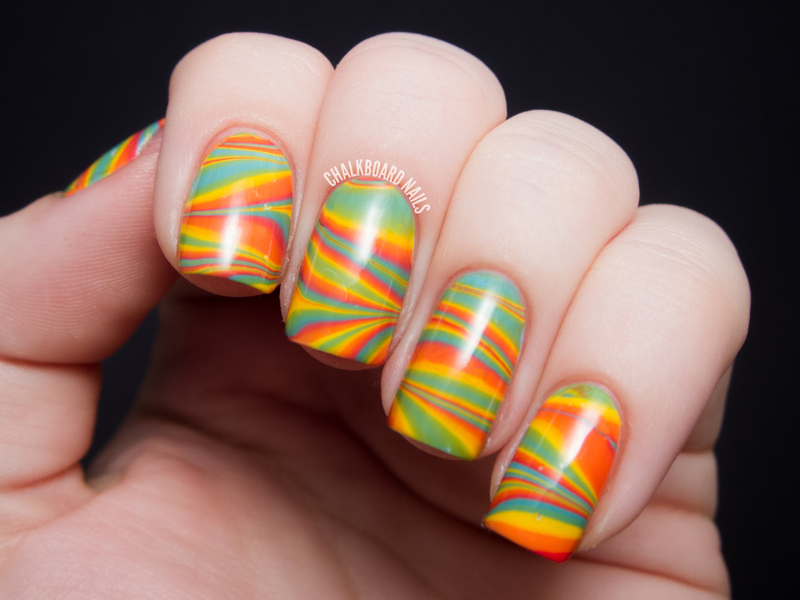 I think these are my favorite water marbled nails I've ever seen, they're absolutely gorgeous!! I hope I can do mine this well someday! Love it! Just like the Fruit Stripe gum I grew up chewing. Lol!